It’s time for my October week two edit for Robyn’s One-Four Challenge. This week I wanted to focus on the spiderweb and bokeh. I also wanted to give the image a slightly a magical or spooky appearance. Hopefully I succeeded. To finish off I returned it to Photoshop where I overlaid it with a soft light fill layer at an opacity of 13%. Whilst I’m really happy with this week’s edit I had actually intended to create an image using blended layers. Unfortunately, I just don’t seem to be able to get the knack of it! Very few of the online tutorials seem to apply to Photoshop Elements 13 and very little I tried seemed to work as I wanted it to. Grr. Maybe I’m just too much of a perfectionist to accept my meager attempts… Hopefully over this week I’ll be able to spend more time working on it and by next week I’ll actually have something worth sharing. Thanks, Yinglan. 🙂 Mysterious is part of the effect I was going for! I’m glad you like it. This is perfect for the Halloween season!!! Love it!! I always knew I wanted to do something spooky for October. 🙂 I’m glad you like it! Thanks for visiting. These are wonderful. I’m sorry I missed them last week. I’m glad you like them, Desley. 🙂 It’s easy to miss things – there are always far more posts that I’d like to visit each week than I have the time to look at! Thanks for visiting. Oh Louise, your meagre attempt is not meagre at all! Great focus on the cobweb through the crop and light filters. I like it! I love how the spider webs glow!!! I love it. Shooting into the sun adds a great haze overall which adds to the spookiness. I like this edit, so mysterious and eerie! I really like the zoomed in on the web and the blue hue, it does give it a more mysterious/fairy feel. 😀 I don’t know much about PS Elements, but wishing you luck on your endeavors this month. Lovely and spooky – perfect for October. 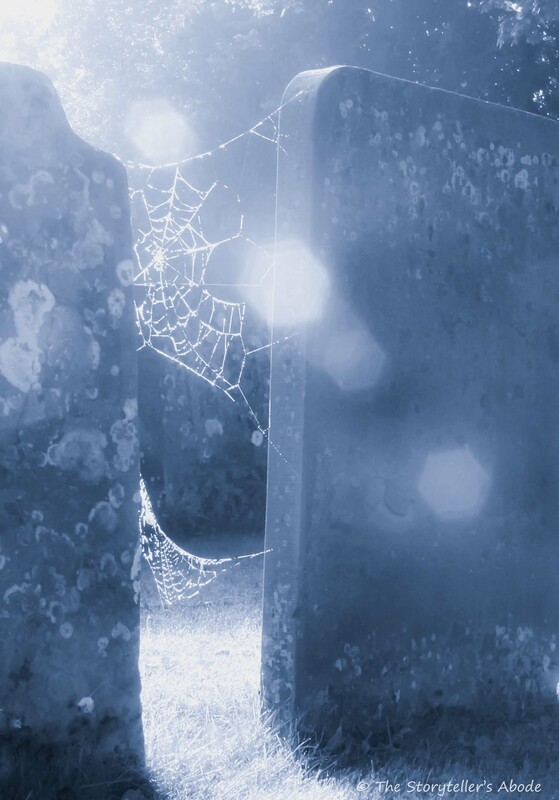 The spider web is really highlighted in this crop, and the blue tone is appropriately chilling. Great work! I love this cooler, more mysterious feel and love that crop! I’m particularly fond of the close crop as well and have been thinking about returning to it for next week’s edit. 🙂 Thanks for visiting.